Underwire bra top features crochet overlay, stretch foam, and grommets with lace through adjustable straps. Hooks at back. Vintage cut high waist bottom with features crochet overlay and lace up grommet detail at back. Offers full coverage. By Ariel Gordon. 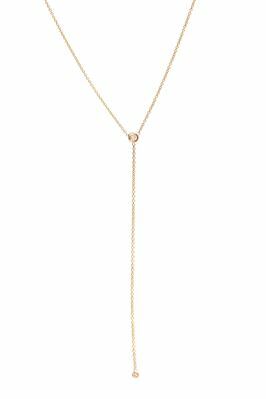 Crafted of 14k yellow gold, with a 5pt diamond in the center and a 1pt diamond dangling from a cable chain drop.